Discussion in 'Member Downloads' started by brrainstormerr, Sep 6, 2011. 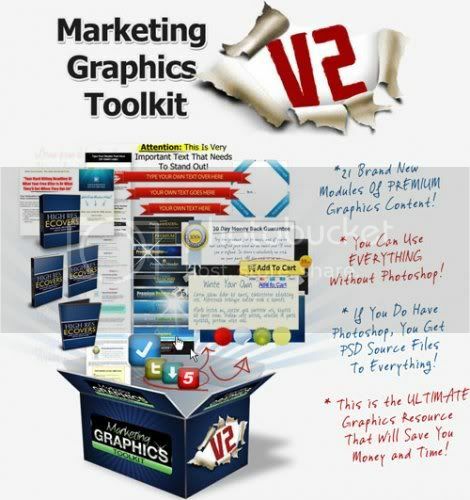 This "Marketing Graphics Toolkit" V2 package consists of some of my very best tools and templates that are geared specifically towards Internet Marketers. These tools and templates will add some KILLER visual flair to all your websites, blogs and even WSO's. With 21 different Modules, there's something for everyone here. Just one piece of content from this package can save you either a hundred bucks on designer fees, or hours of time trying to do it yourself. luukmuu, massin, Danyx and 25 others like this. any social media stuff in there? Let's get a reup on this one. It looks like good stuff. GordonShumway, The Alchemist. and rgold like this. what graphics do you like from this package? Can a mod please add a [GET] tag to the thread, title...? Anyone have the video tutorials that were supposed to come with the package? It is Module #18 per the sales page. WOW! Thank you for the share. Exactly what I've been looking for. Oh Wow! Same warrior just came out with Marketing Graphics Toolkit V3! I just had an email plugging the new v3 , looks amazing ! anyone got this ? if please share. I'm ready to share it, but for now the forums says "don't have enough posts to submit links" (I need 10). Looks like you've got 11 now!